Spring has gotten off to a great start, and it’s going to get even better! I had a wonderful opportunity to sing at Pinnacle View‘s women’s beach retreat at Trinity Center in Pine Knoll Shores in late March. What a supportive and gracious group – they brought me to tears when they started singing along to “Making My Way Back to Me!” Such a gift. Many thanks to Elizabeth Trinkaus for inviting me. 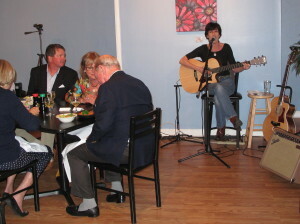 Bistro-by-the-Sea in Morehead City asked me to perform during Toast to the Coast week, and it felt great to sing some gems I hadn’t had an opportunity to play in a long while. Thanks to owner Libby Eaton for inviting me back (date TBD). 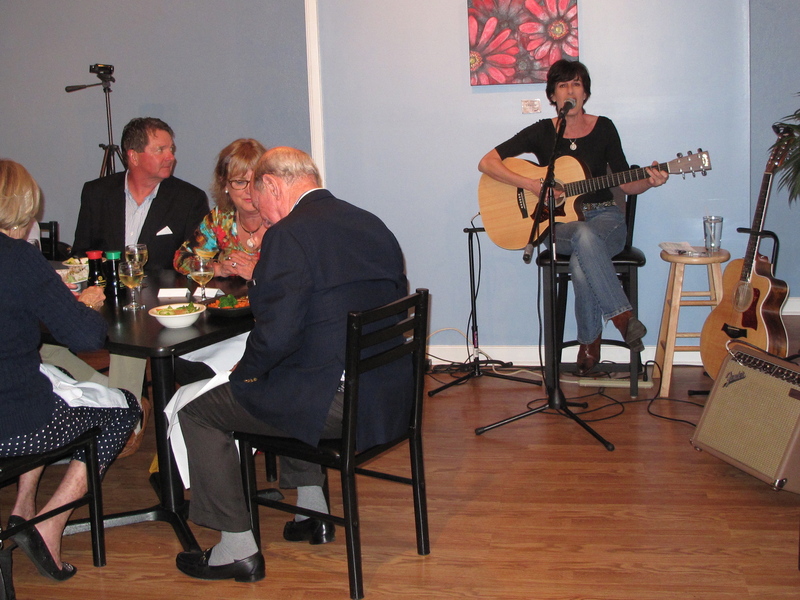 Last year I sang at Akai Hana in Morehead City, and thanks to owner Bob Honeycutt I recently had another opportunity. I loved singing in the relaxed atmosphere for a very friendly and appreciative group. It looks like I’ll be playing there again during Memorial Day weekend; stay tuned! I continue to be amazed by the reception my music receives, and am so grateful for every opportunity to share it with an audience. Please check the Dates page for upcoming spring performances, which will include Cara Bonnett, Tom Ed White, and special guest cellist Janet Hadler. I’ve spent the last several weeks recording and doing lots of practicing; it’s been so nice to focus on these activities, and to be able to give more thought to arrangements. 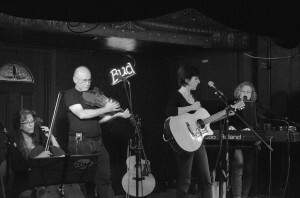 I’ve posted two new songs (see Music): ‘American Man’ and ‘The Escape,’ the latter with Cara Bonnett on keyboard and background vocals. It’s so gratifying to have these available for listening. Spring gigs are starting to line up (see Dates)! I have a couple of solo dates coming up, then the group will be coming together at The Kraken Bar on Sat. May 3 at 8pm. 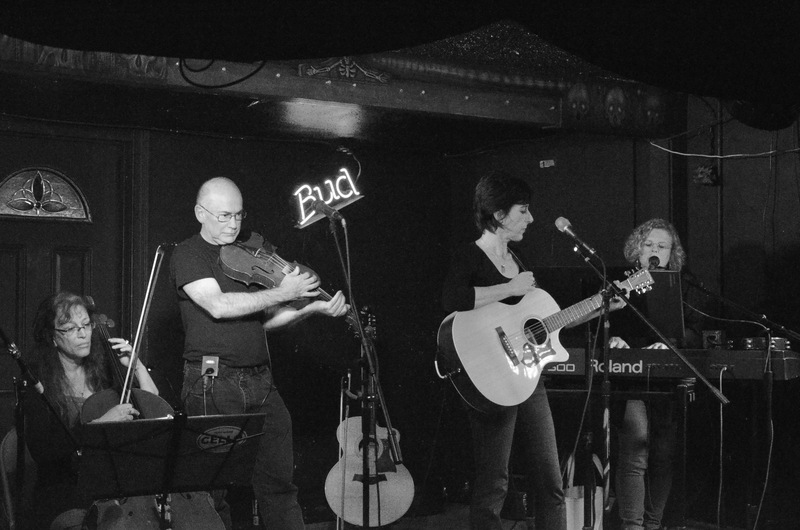 We’re very excited to play out again and perform our new songs, a few of which are Cara’s originals. See you out there! Very intentionally, we haven’t scheduled any performances for the winter months. It feels great to slow down a bit, have time to write new songs, and to think about where I want my musical journey to take me in 2014. We’re currently working to create better-quality recordings of our originals, ones that more closely represent how the songs are performed live. It’s fascinating to see how once first created, a song grows and changes as we work with it over time until it feels just right. I’ll publicize any new recordings via my mailing list and FaceBook. We plan to perform again in the spring, and in the meantime, stay fresh by playing at local open mics and debuting new songs to those audiences. Here’s to making new music in the new year! The year is winding down, with only two scheduled gigs left to go! I’ll be at Akai Hana in Morehead City for a solo gig on Nov. 8, and the band will play a private party in Raleigh on Dec. 13. Hard to believe it’s time to nail down a few holiday tunes….Over the next couple of months, I’m looking forward doing some songwriting and heading out to open mics to try out new material. 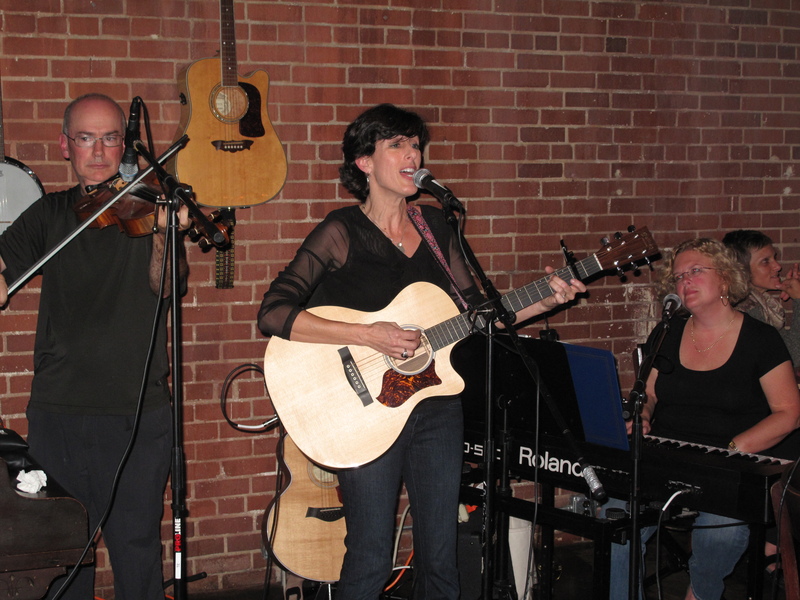 This year has been busy and exciting – over 25 gigs played in the Triangle and at the Crystal Coast! When I set my goal to perform at an open mic several years ago, I never imagined I’d be playing at local venues and outdoor festivals within a few years. I’m feeling very grateful for all the opportunities that came my way this year, for all the people I’ve met, new friends I’ve made, and for the encouragement and support of my bandmates, my friends, and family. Very special thanks to my husband Keith, without whose support I could not do this! 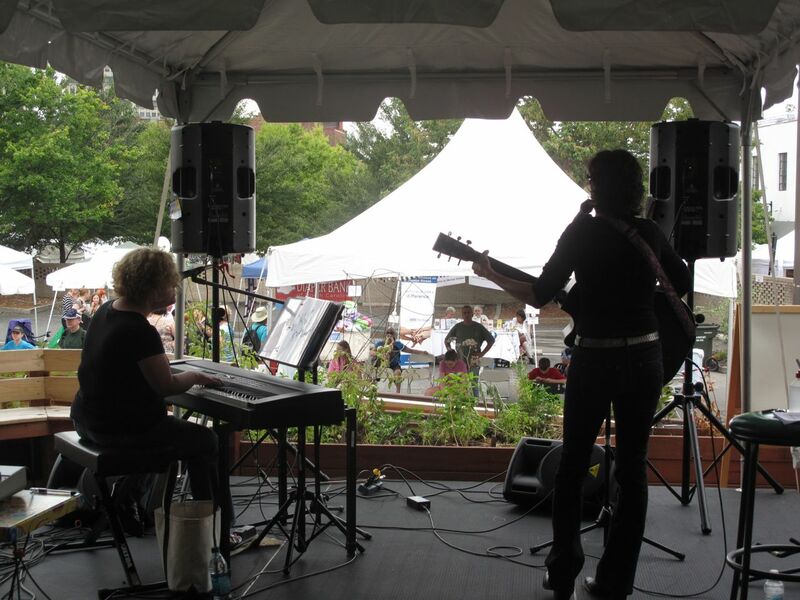 This past weekend, Cara and I sang at the Durham Arts Council’s CenterFest — a first for both of us, and the first time we played an entire set of original music. We played for an appreciative crowd at the NC Songwriters Co-op stage; the audience feedback felt great. When the audience connects with an original song, there is just nothing like it! 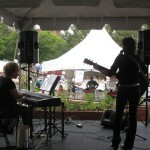 Next weekend we’ll be at the Carrboro Music Festival, again at the Songwriters stage. It’ll be a short set, but we can’t wait for another opportunity to expose our songs to a wider audience. This is a great festival and we hope to see lots of friends out there! Our first entry in a songwriting competition! Cara and I just submitted our first collaboratively-written song, Keep It on the Road, to the Joyful Jewel’s 1st annual songwriter’s competition, to be held Sat. Sept. 14 in downtown Pittsboro from 7-10pm. We’re very excited to expose our songs to a wider audience, and plan on doing so more in the future. Please plan on attending if you can – the audience votes!